If you’re thinking about retiring early, Work Optional is a great roadmap for questions you should ask yourself prior to the decision. Even as someone who writes about the subject, there were new ideas I hadn’t thought about in this book. Written by Adam on February 12, 2019. Updated April 25, 2019. 13 min read. Financial Independence. 1 comment. One thing I’ve been most excited about since leaving my job is having more time to read more. My bookshelf is overflowing already and there is no shortage of amazing new things to read coming out all the time. I prefer a mix of science fiction, biographies and anything in the self improvement section. Self-improvement comes in a lot of forms. There are books that will help you wake up earlier, develop more grit or learn the secrets of tidying up. One area of self-improvement I don’t see covered as much is around the broader umbrella of life-goals and organization. 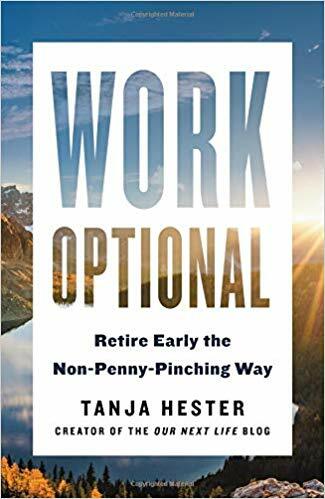 When I was lucky enough to receive an advanced copy of Work Optional: Retire Early the Non-Penny-Pinching Way by Tanja Hester (from OurNextLife.com), I assumed I would be reading a finance book. I was pleasantly surprised to find a guide to organizing a life that incorporates a financial guide, a vision plan, and purpose-filled life. This is my overall takeaway from reading that book! I spent about 2 weeks reading Work Optional to start my days, which offered relaxation and focused introduction to my first month sleeping in. When you think about life hacks what comes to mind? For me, its tweaks to my daily life I can make that optimize tasks and generate more free time. Life Hacking is a long-time passion of mine. Right when I got out of college back in 2005, one of my all-time favorite blogs was LifeHacker.com created and run by Gina Trapani. She’s one of the six people who have inspired me the most in my life, and since then I’ve always been on the lookout for tricks, tools and processes to improve. My wife has heard the phrase “Let’s try an experiment…” many more times than I’d care to admit. When I learned about financial independence it immediately clicked for me, but I wasn’t sure why. It wasn’t until reading Work Optional that I made the connection between FI and life hacking. Both focus on spending time now for a better payoff later. In the case of life hacks, it’s often about systemizing or optimizing a single interaction. Financial independence is no different – it’s about systemizing your relationship with money. Career intermission – Also called a mini-retirement. Taking some time off in the middle of your career. I never did this myself (unless you count right now). I’ve talked to a number of people who have gone this route, including Scott from I Dream of Fire and Andrew from Shift Upwards, who both wrote about their experiences taking some time off. Partial Employment / Semi-retirement – Rather than working full-time, choosing work part-time. Transitioning from a 40+ hour job to a 25 or under job may be possible for you. I was excited last year when my dad transitioned down to a more free schedule. That little bit more time can be huge too! In just a few months I’d heard of my dad joining a Bruce Springsteen cover band, volunteering for a local election, taking weekend camping trips and golfing an impressive amount. Full Early Retirement – Not working anymore at all – or only working on what you want – in other words: not needing generating income. The key is the lack of a need to generate income. You still can, and many do, but it’s no longer a requirement. I imagine I’ll create something that generates money someday (this site doesn’t right now), but it’ll be driven more by what’s fun and useful to create than what’s profitable. Depending on your financial situation, all of these might sound completely out of the question. Work Optional aims to portray these as possibilities, but it’s up to the reader to figure out which one fits best with their relationship with work. So let’s debunk this myth right from the get-go: You do not need to be a magical unicorn with a computer engineering degree, earning six-figures in your first job, with no student debt and no kids, and with superhero-level frugality skills to be able to retire early. I’ve been fortunate enough to be a bit of a unicorn (computer degree, no student debt, no kids), but I can’t say our $100k/yr spending level is exactly frugal. I also only made $37k/yr out of college, so I’m a bit envious of those earning what I didn’t make until I was in my 30s (good work!). One of my favorite exercises in the book is towards the beginning – around designing your lifestyle. What I like about this activity is that it’s focused around creating your own personal mission. I stole some of this from Code School’s mission, which also used the word “enliven” meaning “to make (something) more entertaining, interesting, or appealing” or “to make (someone) more cheerful or animated”. Minafi is one extension of that mission. My job at Pluralsight was another. As was my job before that at Code School, presentations I gave at user group and programming conferences and many other avenues still I’m looking to explore in the future. Even with that, this doesn’t fully describe everything I want out of life. This is only one aspect of life. Tanja puts together an activity for you to create your own mission. Through a bunch of questions (each with a bunch of sub-questions), she hopes to draw out what’s really most important for you by associating what you want with a sense of purpose. The people who are the happiest in life and who tend to live the longest are those who have a sense of purpose. [Day-to-Day Life] When are you happiest? [Day-to-Day Life] What do you want to make time for every day? [Big-Picture Dreams] What did you dream of doing when you were a kid? [Big-Picture Dreams] What role do you want travel to play in your life? [Legacy and Purpose] What problems in your community or beyond do you wish you could solve? [Central Relationships] What communities are you a part of that you value most? [Central Relationships] Who else is part of your vision? [self-worth] What makes you feel best about yourself outside of work? These questions are asked completely independent of money, health and any obligations. This helps get at the honest look at what role they could play in your life. I did a similar exercise last year which led to 101 Things I Want to Know, Have, Do or Be – My Bucket, Goals and Vision List. While this list helps create some concrete ideas, the activity in Work Optional leads towards a more high-level personal vision. In my career, I organized many (many, many many) exercises to brainstorm thoughts and ambitions and organize them around a central strategy. The takeaways from any exercise like this are dependent on how much effort you put into them. To do this exercise myself, I created a Google Sheet (because, well, that’s a good starting point for just about everything) and started answering each question. Eventually, I had answers to all 17 main questions, with a few answers for each. Depending on how much thought you’ve given to these questions in the past, this might be a long activity. It took me over an hour to do it now, and that’s after thinking and writing about these concepts for years. My result was a document that looks something like this (with a column for each question and rows for answers). At first, these weren’t color coded aside from the header groups. After I filled in the answers to each question, the next step was to start grouping them. I copied a bunch of the verbs I was using into another sheet and started sorting them by the number of times they appeared. After I had a bunch of these verbs, I tried to organize them into categories. After some toying around and organizing, I came out with these three categories: create, grow and explore. These connect deeply with me and feel right at home here. Create – I’ve always loved creating things – even if they’re never seen by the outside world. My failure resume is a good indicator of this over time. In order for these creations to help someone’s “growth,” they need to be seen by people, but creation itself is an enjoyable outlet for me. Just this past week I’ve been working on a major revamp of Minafi that has me waking up at night excited to work on it (I tend to get somewhat obsessed). Growth – Personal growth and growth for others has been an ongoing theme for my life. At Code School I worked on somewhere around 50 programming courses seen by millions of people, all helping them grow and learn. I love learning and teaching. For me, learning when I know I’m going to teach is one of the ways I retain knowledge the best. I also love linking together different ideas or teaching in unusual ways to help topics take hold and become more impactful. Explore – It’s no secret that millennials (for which I’m an elder at age 36) love to explore and try new things. Embracing experiences rather than possessions has been a part of my life since I massively downsized after my mom passed away. There are few things better than exploring a new culture, ordering something off a menu I’ve never heard of, or getting lost in a new audiobook (which I count as exploring a story). This isn’t an all-expansive list of all parts of my life by any means. If I had another category, it’d probably be something around slow relationships – taking time to enjoy deep connections with a few friends (which, coincidentally matches up with the INFJ idea of having few friends, but deeper connections). These three categories match up surprisingly well with my personal mission statement too! I help empower [grow] people to transform [grow] their ideas into reality [creation] by enlivening education [explore]. The next step Tanja lays out for this activity is developing an understanding of the difference between where you are now and where you want to be. Which things on the above list are you already doing? Which aren’t you doing? How can you take steps to start moving in that direction today? This could involve subtracting things from your life or adding them – but in either case it’s a matter of focus and prioritization. The common theme from these exercises is a feeling of increased organization and control in your life. It’s better to know than to not know. Like most books and articles that tackle financial independence, there is ample coverage of the financial basics – the 4% rule, asset allocation, medical costs, budgeting, tracking spending, career hacking, safe withdraw rates, etc. If you’ve read Minafi and other FI blogs for a while, most of these sections may seem mostly like a review. Whew, I had no idea that much was going to late-life care above Medicare. That’s crazy. Whew, that’s an interesting one! Social Security is far enough off for many young retirees that it’s impossible to include it in our plans with much confidence. Tanja leans towards the camp of letting Social Security income offset Medicare increases – which makes sense when reviewing this fact together with the chance of it not being there. Who Should Read Work Optional? Those just getting starting on their FI journey. Anyone looking for alternative roles that work can play in their life. People nearing retirement looking to find areas they might not have thought of. As a gift for people you want to introduce to the idea of FIRE in a less-than-scary way. You can read Work Optional today from Amazon, download the audiobook, check it out at a local library or grab it at a local restaurant. Thanks Adam, I agree with the piece about multiple work optional lifestyles. Early on it seems so many believe that the RE is a retire to a beach type thing but as most of us know that does not really appeal to most for the long term in FIRE.